The imperial cities, grand artistic treasures and spectacular architecture of Russia await your arrival. 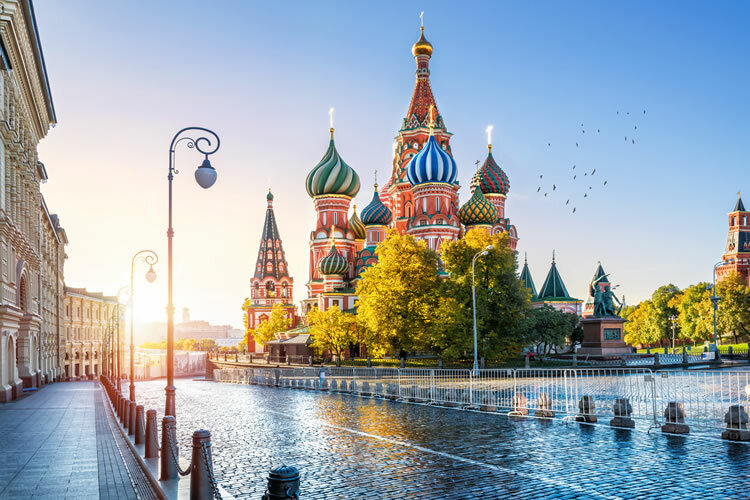 From the glittering metropolises of St. Petersburg and Moscow to the timeless towns along the Golden Ring, you’ll experience Russia in all its glory and splendour. Arrive at Moscow’s Sheremetyevo International Airport. If your cruise package includes a group arrival transfer or if you have purchased a private arrival transfer, you will be greeted by a Uniworld representative and transferred to the ship. FEATURED EXCURSIONS: Choice of Panoramic City Tour or Moscow "Do as the Locals Do"
FEATURED EXCURSIONS: Choice of A visit to Saint Cyrill on the White Lake Monastery or Goritsy "Village Day"
You have sampled culinary delights, explored history and experienced the best of life along the Volga River. Now the journey comes to a close and it’s time to disembark the ship. If your cruise package includes a group departure transfer or if you have purchased a private departure transfer, you will be transferred to Pulkovo International Airport for your flight home. Your Uniworld adventure may be over, but we know you’ll enjoy the memories you’ve made for years to come. Terms and conditions apply, all offers are subject to availability and operator booking conditions. All savings are included in the fares shown and were correct at time of print, but are subject to change. Fares are per person based on 2 people sharing a stateroom. Order of sightseeing may change throughout the itinerary. Substitute visits to other sites may occur during your trip due to water levels or other uncontrollable factors. ^Itinerary operates in reverse. *Savings of up to 30% are valid to new 2019 bookings only made by 31st March 2019. Savings are based on cruise + flight/rail fare. Offer does not apply to any air/rail supplements. Offer applies to full-fare bookings only and is not combinable with any other promotional offer or programme, except River Heritage Club savings. Offer is capacity controlled and may be modified or withdrawn at any time. Fares are subject to availability and may be modified at any time. Other restrictions may apply. We charge a one-off small £20 booking fee. That’s it - nothing more and no add ons when you pay the balance. ABTA P6710 E&OE.